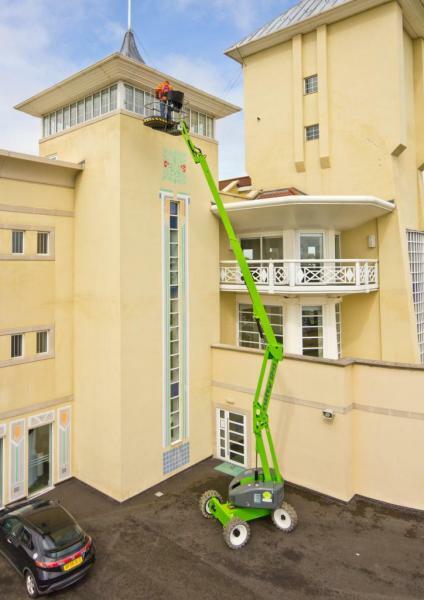 Finally a boom lift with hybrid capabilities! Picture this; a large warehouse needs a few lights changed. The problem – the lights are 40′ high and because you are indoors, combustible engines are not allowed. Enter the 45′ NIFTYLIFT Hybrid. With both a Kubota diesel engine as well as the option to run the entire lift on batteries, this lift is truly versatile. The non-marking tires make indoor use worry-free. Don’t call it just an indoor lift though, the tires are non marking but large and knobby. With the diesel engine, this lift will take on the outdoors with ease.